Humpty Dumpty Institute : Congressional Delegations, 19th Delegation to the U.N.
< 20th Delegation to U.N. 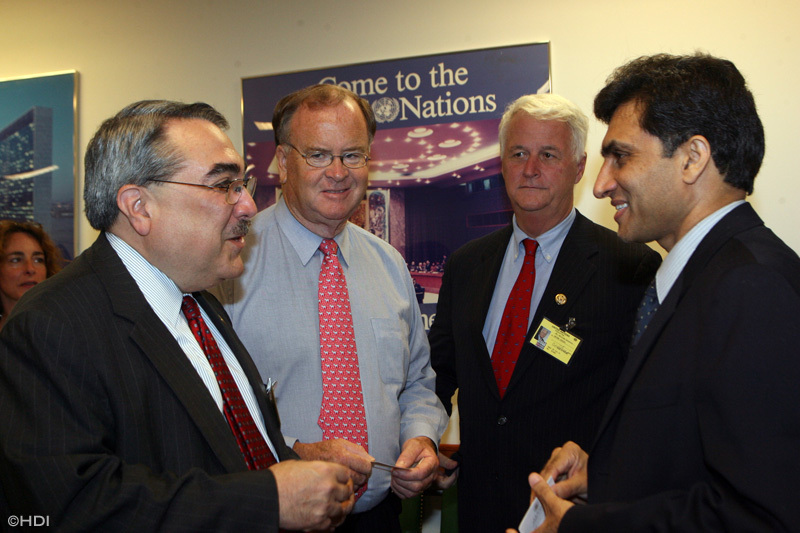 The Humpty Dumpty Institute sponsored its 19th Congressional Delegation to the United Nations Headquarters on June 26, 2006. 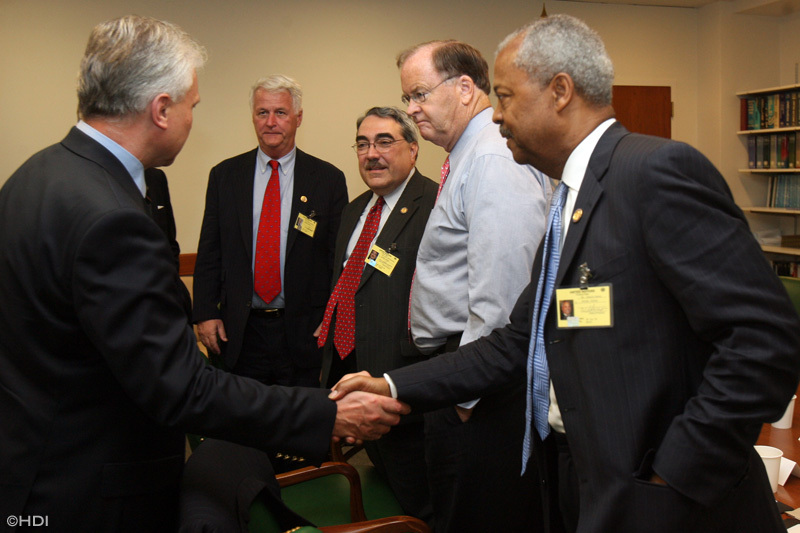 The Democratic delegation, organized at the request of Rep. Bill Delahunt (D-MA), comprised of five sitting Members of Congress as well as Senior Congressional Staff, U.N. officials, The Group of 77 Members and Security Council Members, met to discuss the extension or lifting of the 90-day budget cap at the U.N. which is a crucial component of peacekeeping mission in many global hotspots. 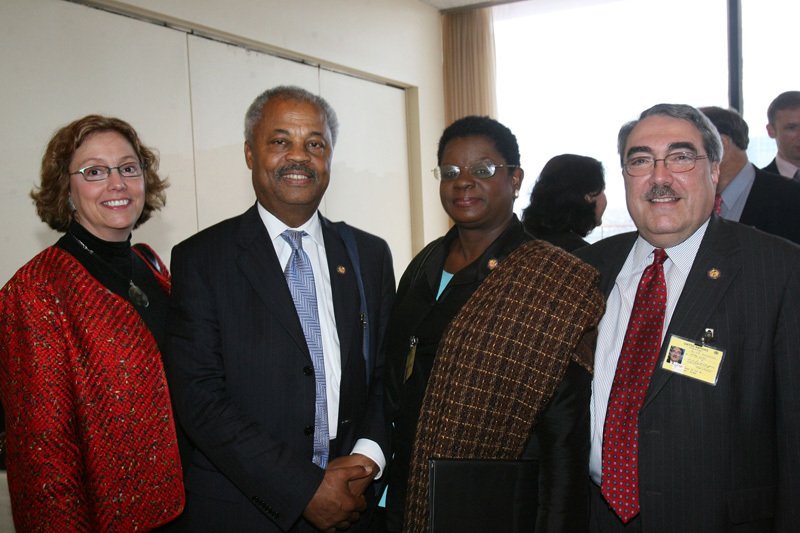 The Humpty Dumpty Institute sponsored its 19th Congressional Delegation to the United Nations on Monday, June 26, 2006. This Members Delegation was organized at the request of Rep. Bill Delahunt (D-MA), a member of HDI's Congressional Advisory Board, and the Ranking Member on the House Investigations and Oversight Subcommittee. 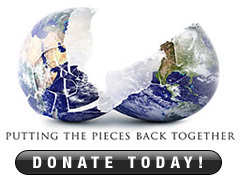 The Members traveled to New York at a crucial juncture: a 90-day budget cap at the U.N. was set to expire on June 30th, and failure to either extend the cap or lift it entirely would result in a complete shutdown of U.N. operations world-wide, including support to peacekeeping missions in Sudan, Haiti, DR Congo, and other global hotspots. 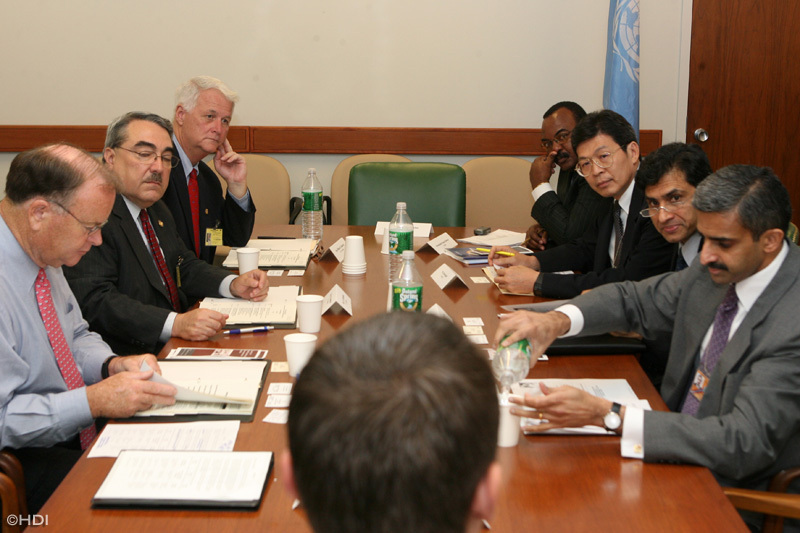 In order to give the Members a comprehensive understanding of the issue, HDI organized several high-level briefings with leading U.N. Member-States, the Under-Secretary-General for Management in order to discuss progress on management reforms, and a luncheon with the U.N. Security Council to discuss the situation in Darfur. Ambassador Mark Wallace, the U.S. Representative for Management and Reform, welcomed the delegation on behalf of Ambassador John Bolton. Ambassador Wallace provided an overview of the ongoing budget negotiations, and outlined the major positions of the donor countries (US, EU, and Japan) and their wish to link approval of the budget to the enactment of management reforms, with those of the Group of 77 and China, which sought to ensure that all budgetary decisions were voted on by the 191-member General Assembly. Ambassador Wallace assured the delegation that reform is an ongoing objective. Jane Holl Lute, Assistant Secretary-General in the Department of Peacekeeping Operations (DPKO), briefed the congressional delegation on the status of U.N. peacekeeping operations, particularly efforts to create the conditions for successful post-conflict governance. She also noted that successful peacekeeping missions are defined by vision, planning, organization, and quality personnel who operate under strong leadership and with adequate resources to complete their responsibilities. Ms. Lute also spoke at length about a recent GAO report which found that in terms of cost to the American taxpayer and effectiveness, U.N. peacekeeping presents a huge advantage over unilateral military action. Ms. Lute spoke at length of the difficulties of mounting an operation in Darfur. She stated that the lack of water in the region, aside from the tremendous humanitarian plight that it causes, makes operational sustainability a challenge that has already confronted the African Union Mission in the Sudan (AMIS). According the Ms. Lute, a second and perhaps more daunting obstacle is the attitude of the Sudanese government, which has publicly opposed the prospect of a U.N. peacekeeping deployment. Until the U.N. mounts an operation in Darfur, Ms. Lute urged donors to support the current African Union mission since the U.N. does not have adequate resources to do so. 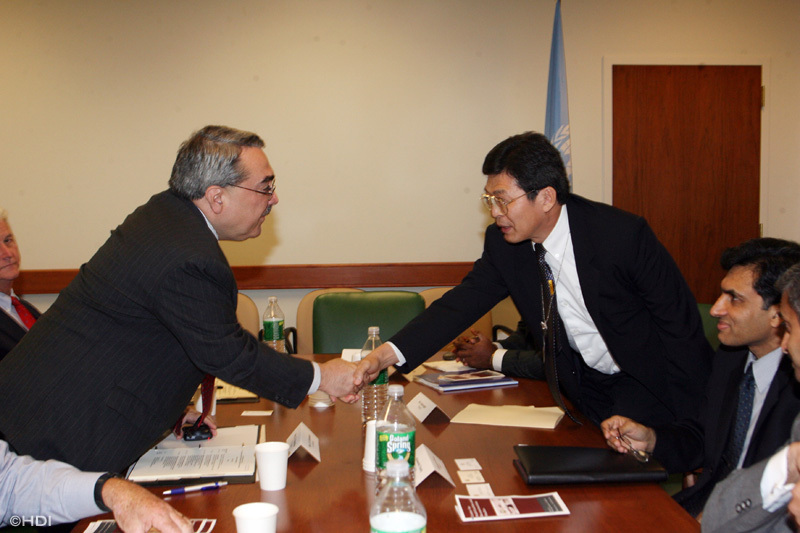 At a Meeting on Budget Negotiations with Key U.N. Member-States, Members of Congress met with diplomats from Singapore, Pakistan, Thailand, and Angola for a candid discussion of the current budget crisis and the status of U.N. reform. There was consensus in the meeting that in spite of its inefficiencies, the U.N. should be recognized for its many accomplishments. One diplomat noted the successes of the reform process in recent months, including the establishment of the U.N. Ethics Office, the Human Rights Council, and the Peacebuilding Commission. Several members of Congress concurred, focusing on the accomplishments of the U.N. in the areas of peacekeeping and humanitarian relief. One member of Congress also expressed the opinion that a world without the U.N. would be "unthinkable." The briefing was both an attempt to learn about various positions toward the budget negotiations, and also an effort to find middle ground. Chris Burnham, Under-Secretary-General, Department of Management, discussed the state of U.N. financial and managerial reforms. Mr. Burnham told the delegation that the establishment of an Ethics Office in January 2006 was a significant accomplishment for the UN. As a result, he said that the U.N. now has annual ethics training and a whistleblower protection policy that gives employees legal recourse and enables them to go to the press. According to Mr. Burnham, the whistleblower protection policy is the strongest of any organization in the world. Mr. Burnham also highlighted the organization's new and improved financial disclosure policy, while he expressed optimism about the external and internal audit procedures that the U.N. is currently developing. Moving forward, he said that the U.N. needs to produce an annual report in order to develop a stronger culture of accountability and transparency. In particular, he emphasized that such a document consists of management discussion and analysis, a clear picture of the organization's finances, and an auditor's letter attesting to the veracity of those finances. Mr. Burnham closed his presentation by asking the members of Congress to do their best to get the appropriations necessary to renovate UN-headquarters, which will cost an estimated $1.7 billion. At a Working Luncheon with Members of the Security Council, the delegation had a frank discussion with several Security Council ambassadors about the current crisis in the Sudan. Several of the ambassadors noted that pressure must be placed on countries in the region to use their political and economic leverage to convince the Sudanese government to do more to stop the atrocities and to support the deployment of a U.N. peacekeeping force. This view was also shared by members of the congressional delegation, which was unanimous in its outrage at the current situation in Sudan. As one member of Congress noted, "we cannot let this stand." Differences of opinion arose regarding the timing of a UN-deployment and the legal mechanism supporting the operation. While most present believed that the situation required immediate action, several expressed the belief that the government of Sudan must give its consent to such an operation in order to create the appropriate political, military, and economic environment to ensure its success. 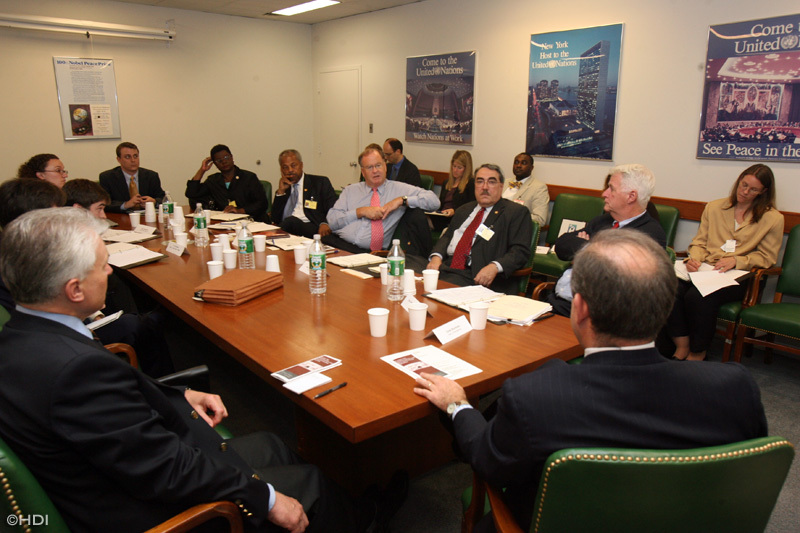 On the other hand, consistent with the views expressed by members of the congressional delegation, other ambassadors expressed the view that the situation in Darfur required immediate attention. They also believed that such a UN-operation should be endorsed under Chapter VII of the U.N. Charter, which would give the operation a robust mandate allowing it to use military force to protect civilians.